I have a J-shaped flower bed that runs about 100 feet along the east side of my property. Because of its size and unshaded exposure to the Sacramento Valley sun, which makes temperatures soar into the triple digits in the summer, selecting plants that will thrive and flower in these harsh conditions has been a challenge. I’ve planted coreopsis, butterfly and humming bird bushes, Nile and fortnight lilies, various thorned shrubs and lots of lavender, which seems to flourish in the bed’s constant exposure. The purple blooms attract honey bees and the flowers can be used in flower arrangements. Sometimes when I’m watering or weeding, I break off the lavender leaves and run them between my fingertips to enjoy the essence. Over time, as I watched this and that experimental plant succumb to the summer heat or winter frost, the lavender keeps growing and spreading. My neighbors have commented on the beauty of these plants while on their evening walks through the neighborhood. I’ve planted more lavender with the same satisfying result. Part of my success is the plant’s origins in the in the Mediterranean region. The ancient Greeks called the lavender herb nardus, after the Syrian city of Naarda (possibly the modern town of Dohuk, Iraq, according to Wikipedia). It was also commonly called nard. 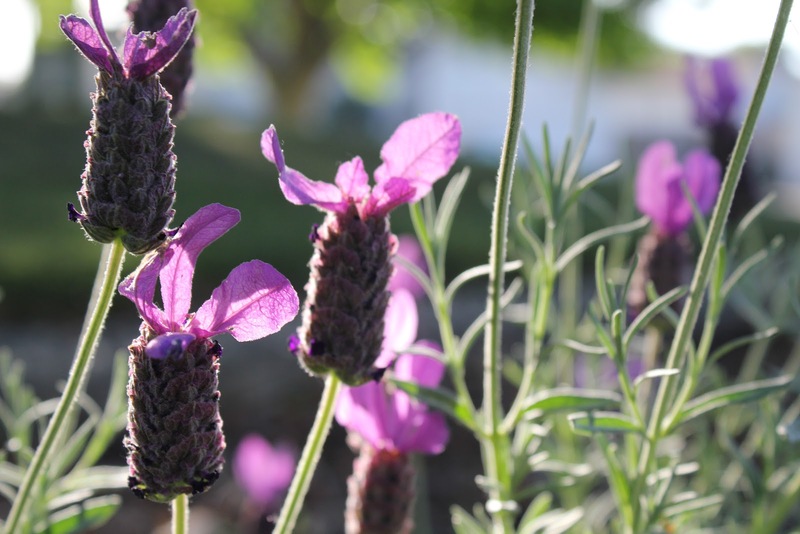 Lavender was one of the holy herbs used in the biblical Temple of Jerusalem to prepare the holy essence of God, and nardis mentioned in the Song of Solomon– nard and saffron, calamus and cinnamon, with every kind of incense tree, with myrrh and aloes, and all the finest spices. Plant historians say that during Roman times, lavender flowers were sold for 100 denarii per pound, about the same as a month’s wages for a farm laborer. Its Latin name was lavandārius, from lavanda(things to be washed), from the verb lavāre (to wash). The Greeks discovered early on that lavender if crushed and treated correctly would release a relaxing fume when burned. 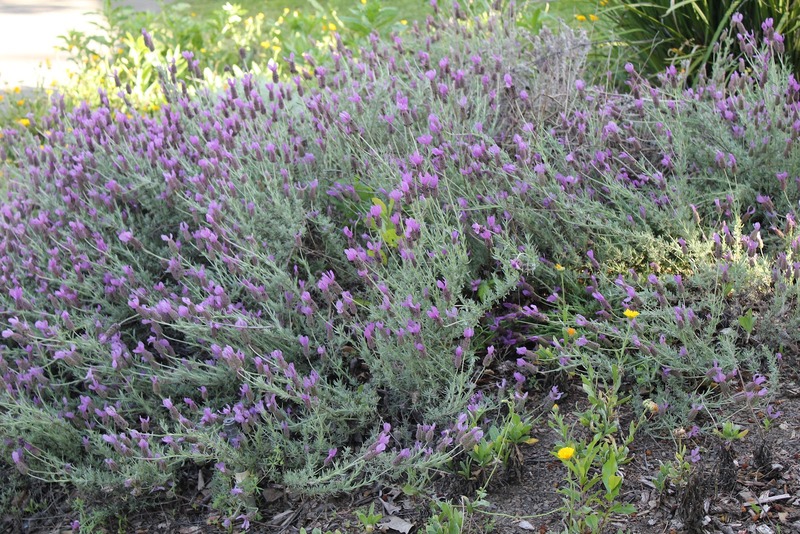 In medieval times powdered lavender was used as a food condiment. But, I find in my research about the history of lavender, that the plant that grows so profusely in my garden has a dark side. Scanning the language of flowers, which is a lexicon of floral statements compiled over centuries for offering flowers as gifts. It seems lavender represented “distrust” to the Victorians. During that era flowers were used as shorthand to convey certain sentiments without speaking them. Floral historians say the primary sentiment for lavender is based in the superstition that poisonous asps (cobras and vipers) live under lavender plants; therefore, the “distrust” of lavender plants. This is probably the most extreme example of a flower sentiment that’s not really associated the actual flower blossom. Since learning this, however, I’m more careful about weeding in the lavender and don’t give the stems as gifts, unless I want to send a message. Author Sarah Berringer Bader says there’s something about lavender that causes people to go slightly nuts. I’m sure the aromatic flowers and foliage play a part, but I think the real reason, she says, lies in those images of fields of purple basking under a Mediterranean sun, with maybe an olive grove in the background. We’d all like to have a piece of that. But, you’ll need to decide which lavenders to grow. Did you know that there are more than 450 cultivars, not to mention about 39 species? No? I didn’t either, at least not until I picked up The Lavender Lover’s Handbook: The 100 Most Beautiful and Fragrant Varieties for Growing, Crafting, and Cooking. There’s a ton of great information here. 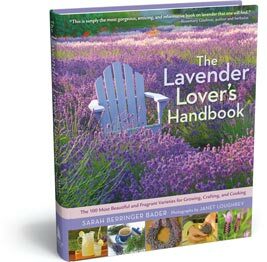 Not only does the author tell you how to grow lavender (even in areas with cold winters or high humidity), she’s whittled down those 450 cultivars to the 100 most likely to make you happy or impress your neighbors. Whether your main interest is flower color, fragrance, size, bloom time or craft and culinary potential, you’ll find varieties to suit your needs. My advice? Pour yourself a tumbler of pastis or a glass of Beaumes de Venise, set your chair in a shady spot in the garden, listen to the drone of the honey bees, and dream away. Provence may not be as far away as you thought. See you in the garden. Wear lavender. Au revoir!